Chicago is a vibrant region for educational innovation, both in and out of school. Several organizations and initiatives are working to transform learning in the digital age. As our collective work matures, there is a shared recognition that, in order to have large-scale impacts beyond any single initiative, collaboration is key to our collective success. That’s especially true when bridging traditional boundaries between formal and informal learning. 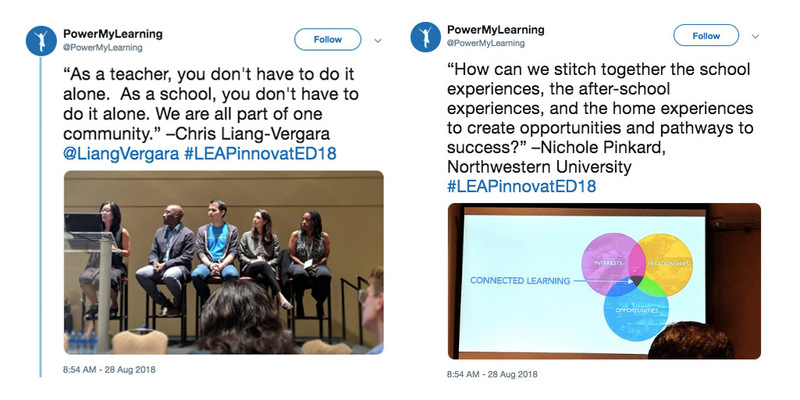 The 2018 LEAP InnovatED Summit was an opportunity to explore how we work together to strengthen Chicago's learning ecosystem in and out of school. In the panel entitled, Realizing the Vision: Collaborative Pathways and Approaches to Connect Learning In and Out of School, the Chicago Learning Exchange joined other local leaders--LEAP, Thrive, and Northwestern’s Digital Youth Network--for a timely dialogue. Linked to opportunities that allow youth to reap the academic, civic, and career benefits of their knowledge and skills. For educators to realize this vision, they will need access to professional learning and networks that build collaborations across traditional school boundaries. Building these partnerships will involve challenges. Using the online polling tool, Mentimeter, input was gathered from the conference attendees--many of them formal educators--about the key barriers to building stronger connections. This is a snapshot of audience responses, with larger words being more common. These public conversations are important steps toward a shared vision of learning that is connected to youth opportunities in and out of school. Chicago Learning Exchange is eager to build more partnerships with organizations and practitioners who share our vision for Chicago as a connected community where all learning counts.